This article is sponsored content brought to you by MK-Dent. Twenty-two years since inception, MK-dent has developed into one of the leading manufacturers for dental instruments worldwide with products sold in more than 110 countries and through approximately 800 authorised distributors. The reporter visited the company in 2018 at its then newly completed head office in Bargteheide (near Hamburg, Germany) and spoke to Fabian Kleene, shareholder and sales director, about new dental instruments, his philosophies on quality and the future of MK-dent. What is the product portfolio of MK-dent and what makes them different to the products of your competitors? FK: Our product portfolio is focused on restoration and prosthetics as well as prophylaxis and periodontology. As a member of the VDDI (Dental Solutions. German Manufacturers) our priority is to deliver a consistent level of quality throughout our product lines. FK: With our German dentist clientele, the contra angle Prime Line slow-speeds are a favourite. The flexibility the dentist gets with the interchangeable heads for the various applications has made this product line a hit. In our high-speed handpiece line, the HP21KL Prime Line is the front runner in the German market. The quietest high-speed handpiece in the world with noise levels below 55dB(A) and an unprecedented power of 25W, followed closely by our Classic Line handpiece HC20KL with a power of 28W. You have set the bar very high for quality. How is this achieved in your daily production? FK: We are trying to achieve perfection for our clients. Our quality promise is based on the use of the best possible raw materials, sophisticated machinery during production and the final quality control of every product through our dedicated quality control staff. Let me give you an example with our quality cartridges. It is of vital importance that all parts are working together. Therefore, we are using for our prime products (Prime Line and Classic Line) a carbide inserts in the bur guide. This provides a vibration free run, which in connection with the ceramic ball bearings, enables us to guarantee an unprecedented lifespan of our cartridges. It is also of utmost importance that the calibration of the rotor blades is done correctly. A slight imbalance of the rotor blade will over time lead to increased vibrations and consequently higher wear and tear of the ball bearings. MK-dent is using a unique calibration method of the rotor by calibrating the cartridges individually for every handpiece housing. Through this process we can achieve the low noise levels of below 55dB(A). Only due to the strict Quality Control procedures and the outstanding life span of our products are we in a position to offer a well rounded and fair warranty to our clients. Apart from the quality, quite often the price is the deciding factor for a purchase. How does MK-dent see the economic relation of their products in terms of purchase, service and repairs? FK: Thank you for this question. We often hear from the dentist that there is a high degree of secrecy surrounding the pricing of dental instruments on the market today. We’ve seen that this often results in a very high RRP that is immediately watered down by discounts and rebates, which in turn makes it very difficult for the dentist to compare the various products on the market. Our price recommendation to our distributors are taken into account and they are attractive to the dentist for two reasons. Firstly, with reference to our quality products, the prices are very competitive. Secondly, the costs for running, servicing and repairing our products are extremely low and fair—an advantage constantly mentioned by dentists in our customer satisfaction surveys. 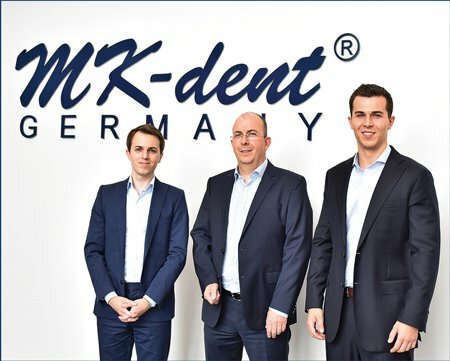 MK-dent is a German family-owned company, established in 1995. Where do you see the advantages of an owner-run company? FK: As a family-owned company, we are putting our name to the quality standards and our values, holding ourselves accountable. The day-to-day management of a family-owned company can focus on quality instead of cost cutting. This is the difference between MK-dent and a public limited company in which the management must report progress by numbers to its investors every quarter. What is the future of MK-dent in terms of products and distribution? How far do you intend to expend? FK: Our future product innovations will be in the field of prevention around prophylaxis and diagnostics. We also expect further innovation across all our dental instruments. We are always trying to develop new products by dentists with whom we are working closely, thus gaining the ‘users’ perspective and practical input at all stages of product development. With regards to growth, we do not foresee any barriers. For us, the utmost driver is to meet the needs of our customers.